Sherman Use Around The World! Chinese forces aligned with the KMT received 34 M4s along with other AFVs during WWII. These saw against the Japanese in China and Burma. M4s were used by the Chinese nationalists during the Chinese Civil War against Communist forces. The PRC is not known to have operated the M4. Taiwan/RoC still operates the M36 on islands close to the mainland. Cuban forces received 7 M4A3 (76)Ws in 1957 and saw action during the Battle of Santa Clara against rebels led by Che Guevara. The rebels captured the vehicles and rode victoriously into Havana on the Shermans including one vehicle being the ride of Fidel Castro. Under Castro’s Govt. the M4s were quickly phased out of service in favor of Soviet tanks such as the T-34/85 and the T-54/55. It is believed an M4 was used by the Cuban Army against the invasion at the Bay of Pigs before being completely replaced. Egypt possessed a number of M4s from Great Britain after WWII and used at least 3 of these in the 1948 war against Israel. Egypt received more M4A4s and M4A2s from Britain after the war, but soon supplemented its armored forces with Soviet armor. Indian units during WWII were equipped with Sherman Vs from Lend Lease to fight in Burma. After WWII, these Sherman Vs were kept in service with the Indian Army after independence and were in use well into the 1960s. India also bought 200 M4A1E4(76)s and M4A3E4(76)s from the US in the 1950s. A number of M4s were modified with the French 75 mm CN 75-50 cannon and the Soviet 76 mm D-85 cannon. These modifications were likely done in India and acquired the guns from their own AMX-13 and PT-76 tanks. In its campaigns against enemies armed with the M4, the Japanese never seemed to have captured an intact Sherman. It wasn’t until 1954 when Japan received 254 M4A3E8s from the US in order to build up the JSDF. These M4s were replaced by the indigenous Type 61 tank during the 1960s. Nicaragua received 4 M4A1E4(105) Shermans from the United States. These were in service during the Nicaraguan Civil War in which M4s were used in Urban Warfare against the FSLN until 1979. Paraguay received 3 M4 VC Fireflies from Argentina in the 1970s and these were later replaced by 3 Argentinian Sherman Repotenciados armed with the French 105 mm gun along with other Argentine upgrades. It is still believed that these M4s are still in service. Pakistan was on the receiving end of the largest single postwar M4 purchase in which 547 M4A1E4(76)s were given to Pakistan by the United States during the 1950s. Around 300 M4s saw their fair share of combat in the Indo-Pakistan wars in both 1965 and 1971. After 1971 war the Pakistani Army retired the M4 from service. 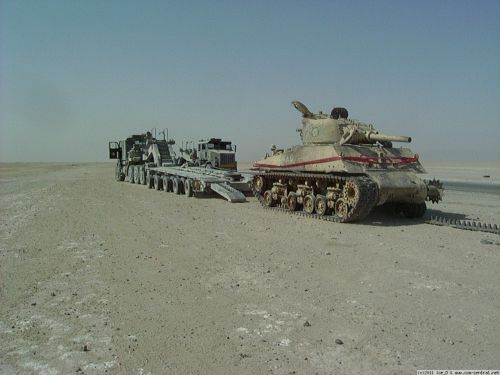 Peru received a total of 51 M4A3 Shermans from deals from the US after the Rio Pact was signed in the late 1940s. They were replaced by T-54/55s by 1978. During WWII, the Balkans saw intense combat between the Yugoslav Partisans and the Axis powers and their puppets. As Tito gained enough power and prestige to be recognized as the true leader of Yugoslav resistance. After the war the defiant Tito withdrew from the USSR’s influence and acquired American vehicles, including the M4A3E4 which were originally fitted with the M3 75 mm gun but were retrofitted with the M1A1 76 mm gun. This gave the Yugoslavian M4s an appearance of being “fireflies” which they were not. (Edit from Jeep_Guns_Tanks) These tanks should be easy to discern from a Firefly by the lack of armored box on the rear of the turret, they would also lack the armored plug firefly tanks had, not to mention, only the extremely rare, and un issued to troops, American Firefly tanks. Yugoslavia also attempted to use the M4 to develop a line of vehicles. The first attempt was the M-634 which mated the M4 with the T-34’s V-2 diesel engine. This project, codenamed “Violin” was initiated in 1956 and saw a limited production of 5 vehicles . Many minor issues plagued the project which lumbered on and spawned side projects such as an upgunned M4, a bridge-layer, and an armored dozer. The M-634’s V-2 was marginally better than the original Ford GAA, but the project was cancelled in 1966 as the effort seemed to be a drain on time and energy. The proposed upgunned M-634 was given the designation SO-122 as it was armed with the Soviet A-19 122 mm cannon, which was used on the IS series of tanks as the D-25T. The SO-122 was completed in 1961 and tested the following year. It was originally developed as a tank destroyer, but as tests revealed the A-19 lacked the penetration of the D-10 100 mm gun, the SO-122 was regarded as a infantry supporting SPG. It only had 2 degrees of gun depression and 10 degrees of elevation which limited its utility such as lacking the ability to fire indirectly. It was able to reach speeds of 42 to 50 km/h with the V-2R engine. The SO-122’s turret was highly modified to fit the A-19 with up to 30 round of 122 mm ammo and a gunsight taken from the Su-100. The bow machine gun was removed from the SO-122 to make room for more ammo. The total weight of the vehicle was 33.5 tons. 96 SO-122s were planned but the project was cancelled alongside the M-634 and scrapped. Another SO-122 project existed which sought to place the M-38 122 mm howitzer onto a turretless M4, this never made it past the prototype stage.